27 years after their last bogus journey, Bill and Ted are slated to return for a most triumphant comeback, titled Bill and Ted Face the Music. The film will feature 50-year-old Bill and Ted who are both married with children and have yet to write the Wild Stallions song that will save the world. The pressure of having not written the song is the primary source of conflict and pressure, which eats into every aspect of these grown dudes' lives. The pressure intensifies when the future shows up, urging them to write the song right now before it's too late. Co-writer Ed Solomon described the third installment as a "kind of like A Christmas Carol with Bill and Ted," which could produce some interesting results. 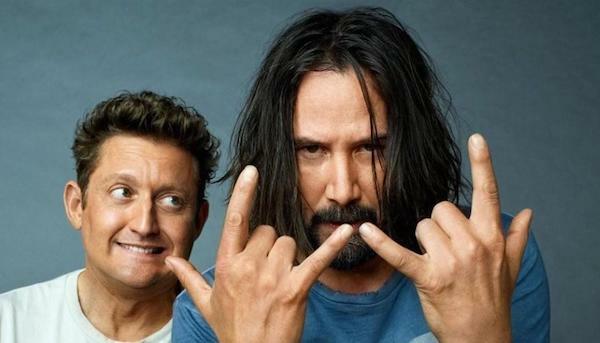 We're certainly most stoked to see Alex Winter and Keanu Reeves back together again. Winter told Entertainment Weekly, "I’m really really looking forward to going back into the playground with [Keanu], with him as Ted and being in that space. For me, the fun of Bill and Ted is the fun of interacting with Keanu and the banter and the way we play with the language and the character, the emotionality and who’s riffing on the emotionality how. That’s really what’s fun about those movies." No director has been attached to the project as of yet; however, back in 2010, Reeves said he wanted Martin Scorsese, Francis Ford Coppola and Werner Herzog to all co-direct it, which I'm sure no one would be opposed to. Solomon says they're still "hoping to close a deal with some financiers", which they hope to have finalized within the next few months. What do you think? Are you stoked on Bill and Ted's triumphant return? We want to know. Share your thoughts and feelings in the comments section below, and and be sure to stay in the viddy well loop...because an untied knot is just a string!